Discover how Qualtrics' new Employee Engagement platform enables real-time data collection. What it does: Qualtrics Employee Engagement enables users to measure employee engagement -- commonly defined as the willingness of an employee to expend discretionary effort -- through online surveys that generate data read-outs in real time. 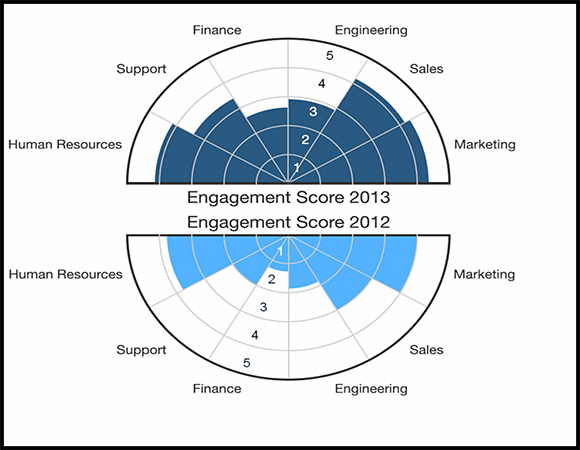 Manager dashboards allow the results to be segmented by department, team and region, among other metrics. Why it matters: Employee engagement has increased in importance over the past few years as research demonstrating the connection between engagement and business success emerges. According to Gallup, companies with high employee engagement have happier customers, less absenteeism, fewer safety incidents, increased productivity and are more profitable than organizations with disengaged workforces. Findings like this have spurred renewed interest in engagement assessment and measurement techniques. Companies often measure engagement with the help of third-party survey providers. However, with this approach, there's a lag between when the collection process closes and the data is reported back to the organization. According to Qualtrics, the Employee Engagement platform eliminates the waiting period -- results are tabulated and displayed as soon as answers are received. Such real-time feedback means that managers can identify problem areas and take action on data faster. In addition, users can customize surveys with unique questions or formats to probe into issues specific to their organization. What users say: After substantial growth stemming from a string of mergers and acquisitions, Sanford Health, an integrated health system company headquartered in Sioux Falls, S.D., was left with disparate methods of measuring employee engagement. In an effort to streamline the measurement process and curb employee survey fatigue, the company adopted the Qualtrics Research Suite and Employee Engagement platform. Besides cutting down on the number of vendors, Director of Human Capital Strategy Scott Schaefer said the system helped address other concerns, such as data ownership (since most of the existing vendors were third-party survey providers, Sanford did not own the results data) and an inability to clearly link engagement and business outcomes. "Oftentimes, because of the way the data was structured, when we got it back from the vendors, we were unable to do that, so that was a huge factor in terms of transitioning to something else," Schaefer said. "Another important thing was getting real-time results; we often waited one [to] three months to get the data back." Sanford developed a customized survey and loaded it into Qualtrics. Employees can answer the questionnaire online through a unique email link in approximately 15 minutes, and results are displayed in manager dashboards as soon as an employee sends in his answers. The data-segmentation capabilities of the Employee Engagement manager dashboards have all but put an end to ad-hoc reporting requests, Schaefer said, saving the HR team time and effort. In addition, underlying analytics and regression analyses in the system make it easy for managers to identify top drivers of engagement for specific employee segments, such as recognition, growth opportunities and manager communication. After results are in, managers review them with their teams and initiate a conversation about how to address flagging engagement. But what about benchmarking? Because third-party survey providers handle employee engagement measurement for a large number of companies, they can benchmark customers against each other, providing a frame of reference for how a company stacks up against its competitors. Schaefer said Sanford addressed this issue by including four questions from a healthcare advisory organization in its survey, with the firm's permission. This way, Sanford can be benchmarked against the organization's other survey clients. However, the company isn't overly concerned with benchmarking. "We try to lessen the importance of how people compare to the external benchmark," he said. 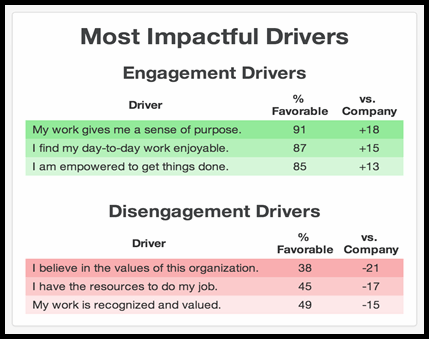 "Rather, our intent is to get a specific set of drivers that will impact engagement most in each area." Preliminary results indicate an upswing in engagement from 2013 to 2014, Schaefer said. And higher engagement means improvements in other areas as well. "We are seeing very high levels of correlation between engagement and things like patient satisfaction [and] nurse performance," Schaefer said. "Through those connections, we know employee engagement is important." Pricing: Qualtrics' full Research Suite platform is priced at $2,500 on AboutAnalytics.com, a website not affiliated with the vendor. However, according to Qualtrics, this figure should not necessarily be considered accurate, as pricing hinges on a variety of factors, including number of survey participants, scale of project, response volumes and required features. The Employee Engagement platform is priced separately. According to a vendor representative, "The [pricing] factors are different, as Employee Engagement is internally facing and Research Suite is often externally facing." Interested parties should request a quote through Qualtrics' website. We use Qualtrics - great product.